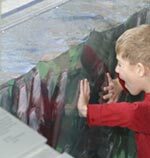 Built as a joint venture between TPWD, the Texas Parks and Wildlife Foundation and the community of Athens, TFFC combines a Visitor Center, educational programming and a production freshwater hatchery. Developed on a 107-acre site, the facility includes a over 300,000 gallons of indoor and outdoor aquariums displaying dozens of species of native fish, waterfowl, alligators and amphibians in recreated habitats. A 14,000-sq.ft conservation center completed in 2007 provides space for meetings and special events. TFFC invites both individual and group visitation. School groups account for about one-third of the 60,000 to 80,000 annual visitors. Guidelines for Group Visits will be helpful for planning a field trip. Reservations are recommended for youth groups of 10 students or more: call (903) 676-BASS (2277) or use our group reservation form. Please note that pets are not allowed at the center. Public hours are 9:00 a.m. to 4:00 p.m. Tuesday through Saturday and 1:00 p.m. to 4:00 p.m. Sunday. Get directions, rates, contact information and holiday schedule. TFFC offers something of interest to everyone who has ever been fascinated by water and the plants and animals that make up the aquatic world. Use our interactive map and list of exhibits to explore online.